Scott has started looking at allocating players to games, based on the 55 responses we have had so far. This may take some time, but I expect he will be in touch sometime in the near future. If you have yet to choose games, its not too late! It's also not too late to register. As of last night you can now signup for your games. Please contact us if you have any problems. Game selection will open on Friday the 23rd of January! It will be a few days before people start being assigned to games, however the sooner you can get your game choices in the better. 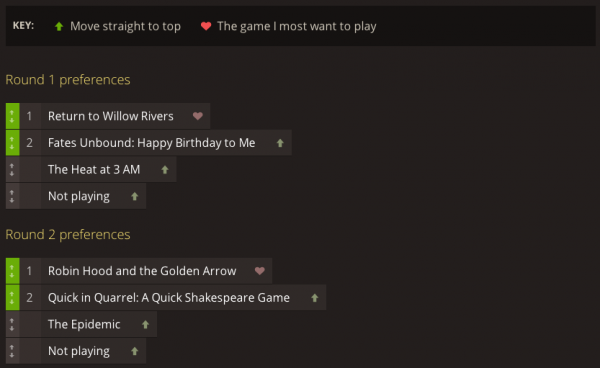 You will also get the chance to specify the one game you don't want to miss out on by assigning it a heart. When it comes to putting people into games, this will be taken into account. Michelle has confirmed that she will be coming back to cook at Hydra, which we are very happy about. There will be some changes to the menu so keep an eye out for that. We would also like someone to help out in the kitchen on Sunday, if you are interested in talking to me about this please get in contact. You may have noticed the site looks a little different. Its now running on Silverstripe. This should make the website much easier to maintain in the long run, and gives those entering content much more control. It hasn't been smoke tested yet, so please do report any bugs you encounter. I hope there is nothing too major, and we can iron them out over time. Because of the requirements of Silverstripe, we have also changed our hosting (and thus, our domain name). We are now hosted with Digital Ocean.